Precious metals futures settled ahead Monday. Gold’s second straight daily gain lifted it above $1,300 an ounce and for its highest close in about one and a half weeks. Gold for June delivery rose $6.30, or 0.5%, to close at $1,301.90 an ounce on the Comex division of the New York Mercantile Exchange. The finish was the highest since March 27. "There’s a little bit of easing risk appetite, the U.S. dollar is weak and we saw Chinese central bank’s acquisition of gold for a fourth month. A combination of all these factors have moved gold into the $1,300s," Reuters quoted Bart Melek, head of commodity strategies at TD Securities in Toronto. 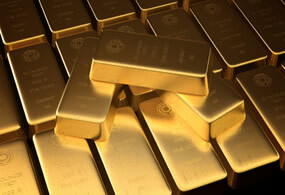 Gold futures ranged from a low of $1,295.50 to a high of $1,307.90. They shed 0.2% last week. Silver for May delivery settled up 13 cents, or 0.9%, to $15.216 an ounce. Silver futures traded between $15.07 and $15.28, Like gold, they declined last week by 0.2%. July platinum rose $7.50, or 0.8%, to settle at $912.90 an ounce, ranging from $905.10 to $920.40. Palladium for June delivery added $7.20, or 0.5%, to $1,353.10 an ounce, trading between $1,335.20 and $1,364.30. The pair last week logged respective gains of 6% and 0.3%. Gold rose $11.55, or 0.9%, to $1,300 an ounce. Silver declined 5.5 cents, or 0.4%, to $15.14 an ounce. In LBMA results last week, silver gained 0.6% and platinum jumped 6.2% while gold fell 0.5% and platinum declined 2.7%. United States Mint bullion sales moved up by 500 ounces in American Gold Eagles and by 500 ounces in American Gold Buffalos.